Using Vertigo sheets, I made window ornaments that allow light to go through them both day and night in reverse way. Enjoy Christmas decoration colors when you are in home from the daylight coming from your window and filtered via the Vertigo sheets, while you share the same decoration during the night to look from outside when light comes from your home. Start by printing the template for the shapes provided in the pdf in the supplies list. 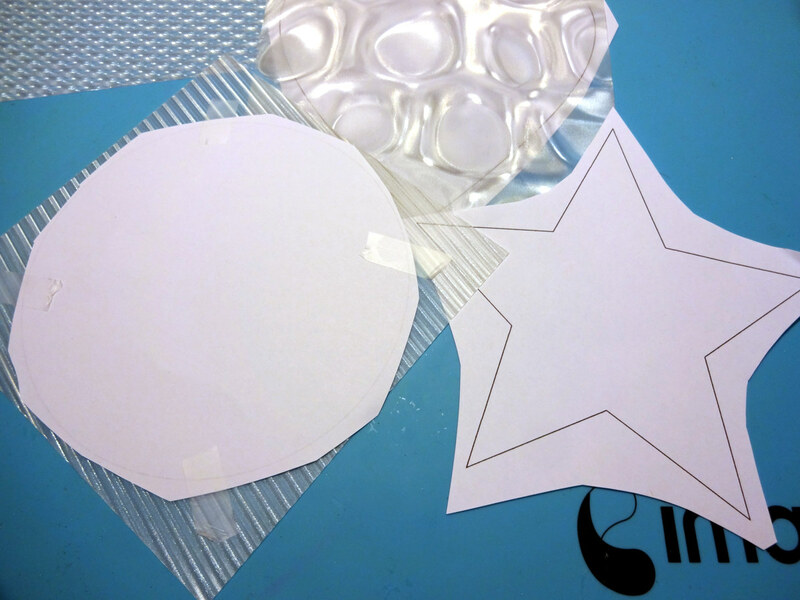 Cut the Vertigo plastic sheets to the template shapes. 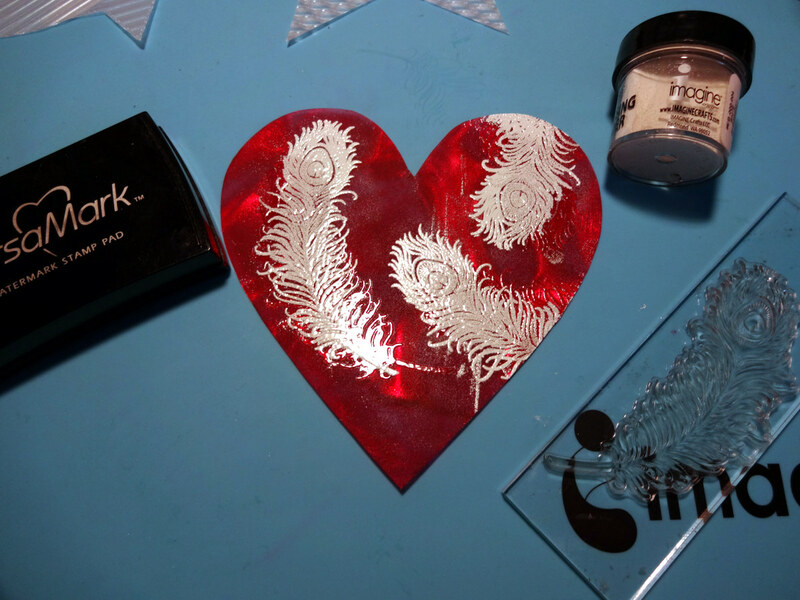 Cover the Vertigo sheets shapes, first with the StazOn Studio Glaze color and when it dries, cover with the matching StazOn ink pad. 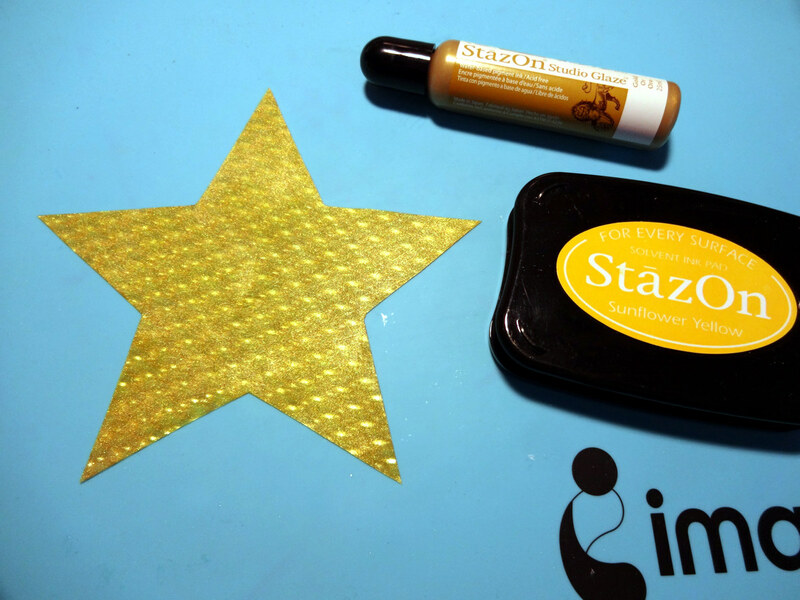 For the star shape 2 layers of color are used of StazOn Studio Glaze Gold. Use the Stipple Brush No 6 and the Delicata emerald green to make strokes following again the shape of three and the way branches should look. Let it dry. Repeat on the other side. 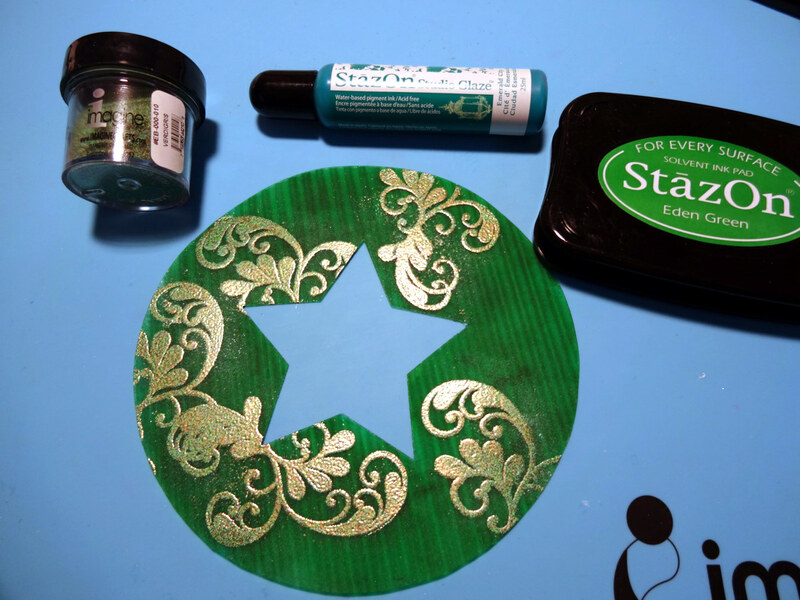 Use a star die to open space in the round Vertigo sheet shape and then, stamp designs with VersaMark and heat set the Imagine’s verdigris color embossing powder. 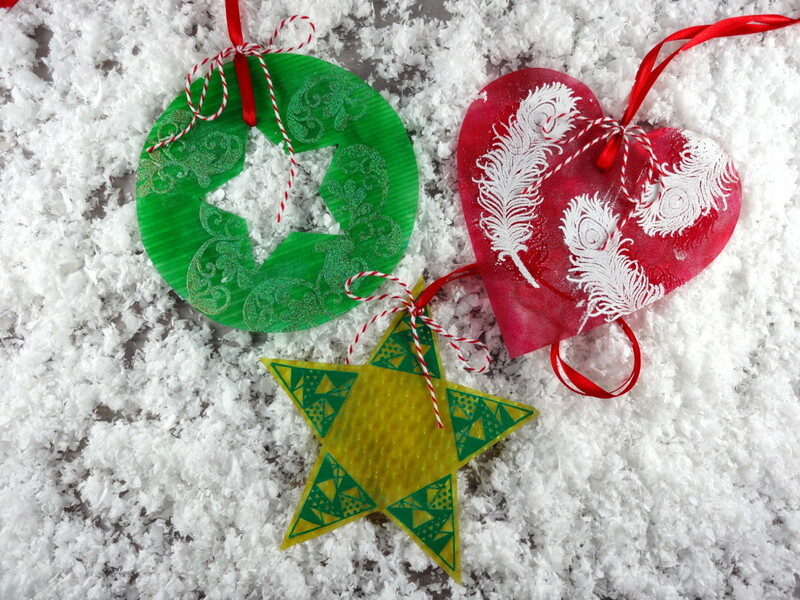 For the heart shape use white embossing powder, for the yellow use green. 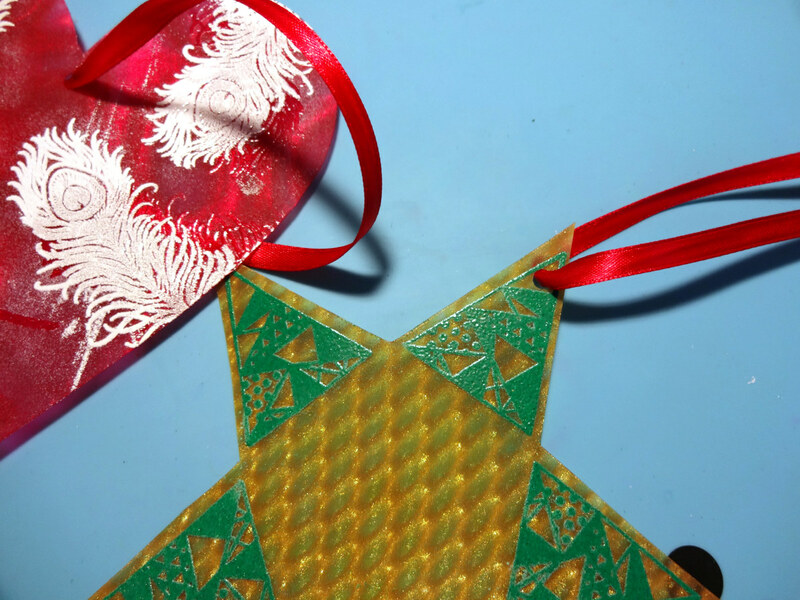 Punch a hole and pass ribbon through it to easily hand them on windows. This entry was posted in DIFFICULTY LEVEL, DIY, Holiday, INSPIRATION, Kyriakos Pachadiroglou, Mixed Media, PROJECTS, UNCATEGORIZED and tagged Craft Mat, Die Cutting, DIY, DIY Inspiration, INSPIRATION, StazOn, Vertigo. Bookmark the permalink.